Paperback, with flaps, 400 pages, 13.5 x 20.6 cm, 5.3 x 8.1 in. The Germany of the future is a land of plenty: consumption is a must, drugs are handed out by the state and civil servants make sure that boredom doesn't have a chance. Reality in Junk Town, as Berlin is only ever called, has a different face. A steely dictatorship makes sure that everyone is kept in the grips of drugs from which there is no escape, and biotech machines rule the day. 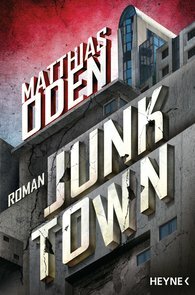 When Solomon Cain, an inspector with the Secret Machine Police, is called to the scene of a murder, he does not yet realise that this case is going to take him to the deepest abysses of Junk Town and hence to the limits of his conscience. For what is left of people when death is only the last big kick?